"Very well, Sister Fox,’" the Old Woman said. "Sit down and warm up while I take my baking out of the oven." Now, the Old Woman was baking some poppy-seed cakes. She took them out of the oven and put them on the table to cool. And the Fox took one look at them, and, snatching up a cake, made off with it. She ate up the poppy-seed filling, stuffed the cake full of straw, covered it with the crust and set off on her way again at a run. "Good morning, my fine lads!" the Fox called. "Good morning to you, Sister Fox!" "Let's trade! You give me a young bull and I'll give you this poppy-seed cake." "But mind you don’t eat the cake till I leave the village." So the Fox gave the shepherds the cake in return for a young bull. She made off with the bull for the forest, and the shepherds began to eat the cake and found it stuffed full of straw. Sister Fox came to her hut and she cut down a tree and made herself a sledge. She harnessed the bull-calf to the sledge and went driving along, and by and by who should come running toward her but Brother Wolf. "Good morning, Sister Fox!" called the Wolf. "Good morning to you, Brother Wolf!" "Where did you get the sledge and the little bull?" "Do let me ride with you a little way, Sister Fox!" "How can I do that? You'll break my sledge." "No, I won't. I'll just put one of my legs on it." "I think I'll put my second leg on the sledge, Sister Fox!" "Don't, for you'll break the sledge, Brother Wolf." driving along again when suddenly there came a great c-r-rack! "Hey thfere, you're breaking my sledge, Brother Wolf!" the Fox cried. "No, I'm not, Sister Fox, I was only cracking a nut." "Oh, well, if that was all!" So the Wolf put his third leg on the sledge, and something went cr-r-ack! – again. "Dear me! You’d better go away, Brother Wolf, or you'll break my sledge!" said the Fox. "No, Sister Fox, I was only cracking a nut." "I haven't any more. That was the last." "You mustn't, Brother Wolf, you'll break the sledge!" "No, I won't. I’ll be careful." "Well, see that you are!" So the Wolf climbed into the sledge and of course it broke under him and fell to pieces! "Go and cut down a tree, you bad so-and-so, and chop it up into logs, enough to keep my house warm and to make a new sledge too, and then drag the logs here!" "You bad so-and-so!" the Fox cried. "You knew how to break my sledge, but when it comes to chopping down a tree, you pretend you don’t know how to do it." "As soon as you come to the forest you must say: “Fall down, tree, crooked and straight! Fall down, tree, crooked and straight!" "Fall down, tree, crooked and crooked! Fall down, tree, crooked and crooked!" The tree fell down, and the logs were so twisted and knobby that not even a stick could be made out of them, let alone sledge runners. The Wolf took the logs to the Fox, and the Fox took one look at them and began scolding the Wolf harder than ever. "You bad so-and-so," she said, "you must have said the wrong words!" "I knew it! What a blunderhead you are! Sit here, and I'll go and chop down a tree myself." And off the Fox went. "I think I’ll eat the little bull and run away." He made a hole in the bull’s side, ate up his insides, stuffed the bull full of sparrows, sealed the hole with a handful of straw and himself ran away. But the bull-calf never stirred from the spot. Then the Fox took up a stick and she gave the bull such a blow that the handful of straw fell from his side, and the sparrows flew out with a wh-o-o-sh! "You wicked, wicked Wolf!" cried the Fox. "You wait, I'll pay you back for this!" She stretched herself out on the road and lay there very quietly. By and by some chumak carters came driving up with a wagon caravan loaded with fish. The Fox lay there without stirring and pretended to be dead. The men looked and were much surprised. "Let's take the Fox and sell it, brothers," said they. "We ought to be able to get enough money for it to buy some liquor." They threw the Fox into the last wagon and drove on. 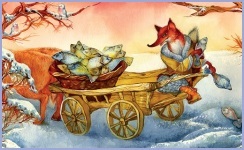 The Fox saw that they never looked back and began to throw the fish one after another out onto the road. Then, leaving the cart only half full, she climbed down herself. The men drove on, and the Fox gathered up the fish, sat down and began to eat. By and by the Wolf came running up. “Hello there, Sister Fox!" he called. "What are you doing, Sister Fox?" "1 can't, I don't know how to do it!" "Go to the river, put your tail into an ice hole, move it slowly back and forth and say: 'Come and be caught, fish, big and small!' That way you'll catch all the fish you want." "Thank you for telling me," said the Wolf. "Come and be caught, fish, big and small!" "Come, good people, and kill the Wolf!" And the villagers came running with pokers, prongs and axes. They fell on the poor Wolf and killed him. And as for the Fox, she still lives in her hut as snug as you please.